This technique reprograms one’s subconscious for positive inner transformation and to open up to the limitless possibilities of success consciousness; generates positive energy for attracting prosperity and abundance; protects against impending calamities and disasters. Law of Radiation and Attraction: The working of this technique is based upon a natural, universal law, the Law of Radiation and Attraction, which states that the energy of the thoughts and emotions you radiate will attract or magnetize to yourself the same kind of energies. The law states that, whatever a man thinks he attracts it, let it be good or bad Hence, if you fill your mind with good thoughts, and do so with intensity, emotion, and focus, thereby radiating the positive energy of good thoughts and feelings (such as joy, vitality, peace, love, and kindness or JVPLK), then you will attract to yourself and bring into your life positive blessings, good things, and beneficial circumstances; but if you habitually dwell upon destructive thoughts and emotions (such as anger, fear, worry, irritation, envy, jealousy, etc.) then you draw pain and suffering into your life. Our thoughts are not just mere superficial ideas. On the contrary, they are very real and they greatly affect our health and our environment. Modern science has already confirmed the existence of stress-related diseases. So we can therefore conclude that poor thoughts can cause poor health. In addition, it would be reasonable justification to point out that modern medicine uses the EEG to measure electrical activity in the brain. From these premises, we can conclude that thoughts are a forms of energy at varying degrees of intensity. The more intense, the greater the effect will be in our material environment. What the Butterfly Effect technique does is that it uses our mind to focus and bring us closer to the more harmonious, creative, and nourishing energy that creates and sustains us; not to the gross vibrations which cause suffering and disease. All the pains and sufferings, the absence of abundance, the presence of bad turn of events, the recurrence of undesirable circumstances are brought about by one’s uncontrolled thought processes that are negative. This technique enables one to put a stop to the negative stream of consciousness, to transfer and expand the positive thoughts and emotions to our environment. All it takes is 7 minutes a day, every 8:00pm to 8:07pm of settling down and emoting positive thoughts. You can reformat your subconscious program and transform all the negative circumstances in your life and start creating all the positive desirable circumstances in your life. Cite scientific validation: For example, scientific researches show that positive and cheerful states of mind stimulate the release by the glands of beneficial hormones and chemicals which boost the immune system and strengthen natural resistance to disease while negative emotions trigger the release of toxic chemicals associated with stress and infection. Synchronized practice at 8:00-8:07 p.m. (Manila time): When the Butterfly Effect is done simultaneously by many people (even if they are geographically distant from each other), the positive energy generated by their combined radiation is multiplied exponentially. Practicing this technique at the same time regularly and repeatedly also develops a habit which becomes implanted into the subconscious mind, producing abundant rewards in due time. Actual practice: Guide participants in doing the Butterfly Effect technique. Encourage every student to participate. How to do it: Briefly explain how the preparatory phase, then the Active and Passive parts, are done. Ensure that they have received their 1/4 copy containing the Butterfly Effect guide. Emphasize the acronym/term “J-V-P-L-K” and remind that this simple technique is performed every night at 8:00—8:07pm (Manila time), synchronized with different time zones throughout the world. (J) — For about a minute, feel the heart to be the embodiment of joy and bliss. Don’t merely think of joy or bliss; feel it as vividly as you can. If you feel the urge to smile, then smile. It may help you feel joy better. Feel each positive attribute as a bundle of energy emanating from your heart. Let this energy radiate all over your body. (V) — Then, for the next minute, feel strength and vitality. Your heart is awash with vim and vigor. With every positive feeling you emote, visualize the light to glow more and more bright and intense. (P) — Then, for the next minute, feel your heart to be filled with goodness and peace. Everything is alright and in perfect harmony. There is peace in your heart, and you are at peace with yourself, with the world and the entire universe. (L) — Next, for another minute, feel your heart to be the embodiment of forgiveness, and that your heart is overflowing with love and bliss. Be sincere in feeling these emotions. (K) — Next, for another minute, feel loving kindness and compassion. Feel as if you want to embrace the whole world and all creatures therein. Afterwards, stop your visualization. Relax and be passive, just feel the beatings of your heart. Law of Radiation and Attraction: The working of this technique is based upon a natural, universal law, the Law of Radiation and Attraction, which states that the energy of the thoughts and emotions you radiate will attract or magnetize to yourself the same kind of energies. The law states that, whatever a man thinks he attracts it, let it be good or bad. Hence, if you fill your mind with good thoughts, and do so with intensity, emotion, and focus, thereby radiating the positive energy of good thoughts and feelings (such as joy, vitality, peace, love, and kindness or J-V-P-L-K), then you will attract to yourself and bring into your life positive blessings, good things, and beneficial circumstances; but if you habitually dwell upon destructive thoughts and emotions (such as anger, fear, worry, irritation, envy, jealousy, etc.) then you draw pain and suffering into your life. An educational theorist and brain researcher who has had a huge impact on teaching practice is Howard Gardner of Harvard University’s Project Zero. Gardner postulates that there are many different kinds of intelligence, and that we all possess them in varying degrees. 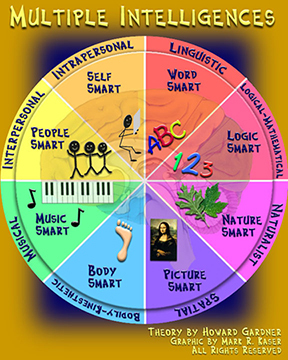 These “different ways to be smart” represent ways of looking at the world that can become doorways to understanding when teachers consciously include differentiated learning strategies in the classroom. According to a traditional definition, intelligence is a uniform cognitive capacity people are born with. This capacity can be easily measured by short-answer tests.